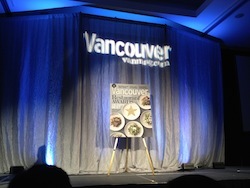 WHAT: Vancouver magazine honoured excellence in the city’s culinary community at the 23rd Annual Restaurant Awards. Based on voting by a panel of 18 expert judges, finalists were chosen in 42 categories including: Restaurant of the Year, Best New Restaurant, and Chef of the Year. New this year were awards for Best Pizzeria, Best Noodle House, and a special award for mentorship of the next generation of chefs. Producer/Supplier of the Year – F.I.S.H.